Home / Analysis and Strategy / Events / kannada and Karnataka / product or service reviews / Aero India 2015: looting helpless general visitors! 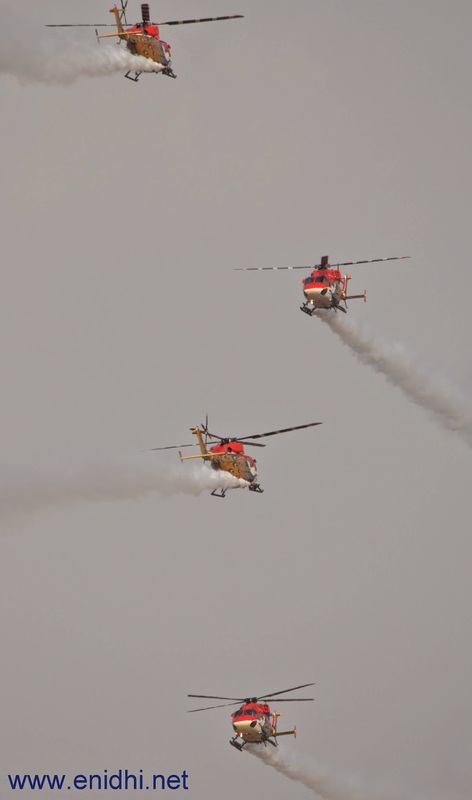 Aero India 2015: looting helpless general visitors! As you may have noticed, I did visit the Aero India show this year in Bengaluru and I had also visited the 2013 edition, both as general visitor (paying Rs 630+). After attending the 2013 edition, I wasn’t very keen to attend again. Then there were news that this could be last edition of Aero India in Bangalore and it might be shifted elsewhere. Because of this, I thought “Ok, let me visit one last time”. When we visited Aero India 2015 last Saturday, thanks to erroneous behavior of BMTC air show special bus that dropped us at wrong place several kms from the right entry point, organizers changing plans compared to last edition (changing gates for general visitors which rendered my previous visit experience useless) and many other contributing factors, it wasn’t really an experience to cherish. End of the show, I am thoroughly disappointed by Organizer’s ‘We don’t care about general visitors’ attitude. Compared to 2013, the facilities and access for general visitors was heavily curtailed. Despite collecting crores of rupees from general visitors in ticket sales, Aero India organizers haven’t bothered to provide adequate facilities/information to general visitors. May be they thought “this is anyway going to be last edition in Bengaluru, why bother wasting money on general public- let us loot them as much as possible and escape”. Below is the comparison of facilities and access provided to general public, in 2013 vs 2015 editions. Go through and check for yourself. What was accessible to general public in 2013 (Gate 5) is now made Business visit area. Only those who pay Rs 2500+ tax can view exhibition, parked aircrafts and get closer look at the show. No access to exhibition at all. All day wait in open sun, airshow is the only thing to look at. General visitors had to be contempt in viewing key stunts from a distance, as they happen far from general visitor area. Can’t get right view, can’t take good pictures. When they do same stunt couple of times, once they can do in-front of general visitor area no? Last time, Gate 5 was closer to main road- even those who came in bus could easily enter Gate 5 parking area and use free transportation provided to enter through Gate 5. This time, Gate 6,7,8 are 3-4kms from Main road. No free transportation for general visitors. Few BMTC buses were there-overcrowded and double priced. Mega traffic jam meant it took 3 hours to reach Hebbal from airshow, unlike 45 minutes in 2013. There was one speaker in one of the tents. Unless you stand right below it, it is not audible. So General visitors get no information about the show (like name of the plane, its specialties etc). One display screen was put in bright sunlight showing stock footage, which is of no use as it can’t be seen in sunlight. Even missing person/other critical information just can’t be heard as public address system was not strong enough to be audible by large crowd in open area. Just one or two in some remote corners, that too overflowing. Since there was no proper place to throw, water bottles, food plates and other stuffs were thrown all over, making the place dirty, unhealthy and pathetic. Organizers completely failed to provide facilities proportionate to number of tickets they have sold. At the counter our ID proofs were not even asked. BMTC airshow special service was another rip off. No passes allowed, ticket priced twice as much and many drivers had no clue where to drop off people. The bus I was in randomly dropped us off in front of Gate 5, while our entry was Gate 7, which is 5-7 kms away. Driver ignored the left turn for general visitors and headed straight, making us go through lots of inconvenience. BMTC diverted 100s of buses from general duty to feed airshow, inconveniencing rest of city who had no interest in airshow. Not enough chairs- probably one in 25 got something to sit upon- others had to stand all day or sit on the rocky ground. There were two tents, but sitting there meant not being able to view anything- ceiling blocks view of the sky and people ahead will block view from front. Garbage everywhere by post lunch time- no cleaning staff, not enough dustbins. No volunteers/support staff for any assistance/information. Below: A mother making her son stand on a chair without 2 legs and holding it all through the show so that her son can get better view. Empty VIP area at which all shows are focused. General visitors should be contempt with a far away view of critical stunts/moments. There was one white screen placed somewhere between two tents. People who set it up had no idea of lighting and display. Had this been set up inside a tent, it would have been viewable. In bright sunlight, this screen was impossible to see. Even then it was showing only some stock footage. Most of the security guard/staff have no proper briefing. They are only interesting in sending you away- even if it is in wrong direction, just to keep area in-front of them free. For lakhs of visitors expected, there was this one small speaker. Unless you stand below it, nothing is audible. Clearly organizers never bothered to arrange systems and facilities proportionate to no of tickets sold. Except a few namesake facilities, it was like a shepherd heralding hundreds of sheep into an enclosure and having fun watching them. General visitors are given a much longer exit route. Going back to main road and taking right towards Hebbal would have been quicker, but return vehicles are directed into interiors of Yalahanka and had to spend several hours on congested interior roads before reaching main road. Organizers could have widened roads where possible or made a shorter route to highway keeping in mind inconvenience enforced upon lakhs of visitors. As per media reports, there were 1.5 lakh visitors on last day, similar amount on Saturday. Assuming most of them are general visitors, there were about 3-4 lakh+ general visitors during Aero India 2015, which would have generated revenue worth 20-25 crore rupees easily (Rs 600 per person). Facilities provided for general visitor wouldn’t have cost more than a crore. Organizers clearly failed to provide enough facilities and information to general visitors, taking them for granted and subjecting them to go through a series of inconveniences and regret their decision to buy the ticket. Also most of the items were repeat of 2013. Only 2 attractions were new. So repeat visitors unnecessarily pay huge money and suffer inconvenience not proportionate to the joy of watching new attractions. General visitor will only get a view once aircrafts go up in air. Landing and take offs can be viewed by only a prevelieged few who could get a position closer to the fence. For most of the general visitors, take off and landing would appear like above..
Below is another comparison: On the left is the 2013 view of Sarang Helicopters crossing each other- which happened straight in front of us, on the right is the best view I could manage in 2015, due to a far away viewing point. There’re many places in Yalahanka from where one can see the airshow for free. Because of organizers uncaring attitude towards fare paying general visitors, I do not have any motive to buy a ticket for next edition. I will attempt to find some good spot from where I can see the show for free. I might have to compromise a bit on the closeness of the show, but that should be worth the money saved and inconvenience avoided. Plus I will have the advantage of viewing from different places- like morning show from Spot 1, Evening show from Spot 2. There is always Television. If you’ve been to this year’s Aero India as a general visitor, please share your experience here. Update: 2017 Aero India was also in Bengaluru, 2019 Aero India will also be in Bengaluru [News] I think Aero india organizers are just trying to get more n more benefits from State Government by threatening to move Aero India out of Blr. If they can't provide basic facilities for the paying public then it should be kept free. General visitor fees is now Rs 1800+ tax/bank fee for the 2019 edition. If there's no improvements in infrastructure and logistics, (very unlikely), this will be a total waste of money. The most frustrating part for me was that they don't even have enough chairs for general visitors to sit on in the open field. They can certainly take Rs.2 out of the 600 we pay to rent those plastic chairs! Another goof up was that those driving to ADVA were directed by signs not to take the elevated highway near Esteem Mall. Having to drive on the service road meant driving in the narrower road and stopping at traffic signals, adding to the delay. The fastest way would have been to stay on the EH and take the first exit to turn left towards gates 8/9. Whether they hold AI here next year or not, this almost certainly will be the last time I visit! Wonderful post with lots of important points of course and the view of the jets are fantastic. Thank u for the wonderful share. Keep posting with lots more. Oh! That is very sad. But I love how beautifully you have captured the show. Another thing I fail to understand is why these so called VVIPs need to have a joy ride during air shows, cheating the people who paid and came to watch the birds fly. Let them fly on their own time instead of showing off in front of us! I went one year. And we were dropped off at the right gate. But there was an accident on that day. We were on one of those 'city swap' buses and were on the upper deck and after we exited the main road and were going toward the gate, the bus passed some low branches and a colleague of mine had a bad cut on her head. Ironically, that's the first thing that comes to mind every time I hear of this event. Sad to hear about the garbage and all. I visited the 2013 show to try my hands at some aviation photography. While I was not very happy with the experience, I wasn't too disappointed either. I can relate to the conditions you outlined during 2013 show and you're right on the mark. I had an opportunity to go to the 2015 show with some complimentary tickets. I decided to skip it based on an intuition, and now I am glad I decided not to go. Thank you for the well written/researched article. I enjoyed reading it. So, this time decided not to go there. D. Nambiar: Before the show rumor was that this will be last edition. But on day 1, defense minister announced that next edition also will be in Bangalore.